The Livermore Library is something to behold. Not more than five years old, it looks like a modern cathedral of books! Because Flygirl was the Livermore Reads title for the year, the entire month of February was dedicated to the themes in the book. The first evidence of this was in the hallway leading to the community room. The walls are an art gallery. This month, they featured vintage World War II airplanes in photographs and artwork from local aviation photographers and enthusiasts. It was gorgeous! Librarian Paul Sevilla, Jennifer Mosel and their crew really outdid themselves. They also did a staged reading of FLYGIRL with the local Shakespeare repertoire and volunteers. Local aviators gave a talk on flying, including reps from the local Tuskegee Airmen group—a special treat for Black History Month. Kids made paper airplanes and studied birds in flight at the Sulphur Creek Nature Center. And on Sunday, I was sorry to miss a concert featuring the Swingin’ Blue Stars singing hits from the 1940s—just like a USO tour! Our crowd filled Community Rooms A and B until there was standing room only. What was most surprising was the diversity of the group. Men, women of all ages, and a few actual YAs, plus some younger kids. Lots of adults had joined in reading the book, and they all turned out. A good group of “Friends of the Library” were present, as were some wonderfully impressive adult students of the library’s adult literacy program. One woman arrived late, rushing in with her grandkids to tell me Flygirl was the first book she’d ever read and enjoyed. There were tears in our eyes and lots of hugs after that! Livermore is a reading town, no doubt about it. I talked about the origins of the idea for the book, about the plight and late recognition of the Women Airforce Service Pilots, about the struggle for civil rights of all sorts then and today. Thanks to IT whiz Nate, we heard a brief snippet of the Radio Diaries documentary that inspired the book. (You can find the full piece here.) And then it was time for questions. Such a thoughtful group! Everything from the art of writing to the references to other works in the story. Imitation of Life, Bessie Coleman, and more. There were several teachers in the room from the middle and high school, all teaching the book in class. It’s a popular read aloud title! All in all, it was a wonderful day. I’d like to give a shout out to the new adult readers, and to the aspiring writers that attended. Keep up the amazing work, each and every one of you. Learning a new skill can be a struggle, but the achievement is its own reward. 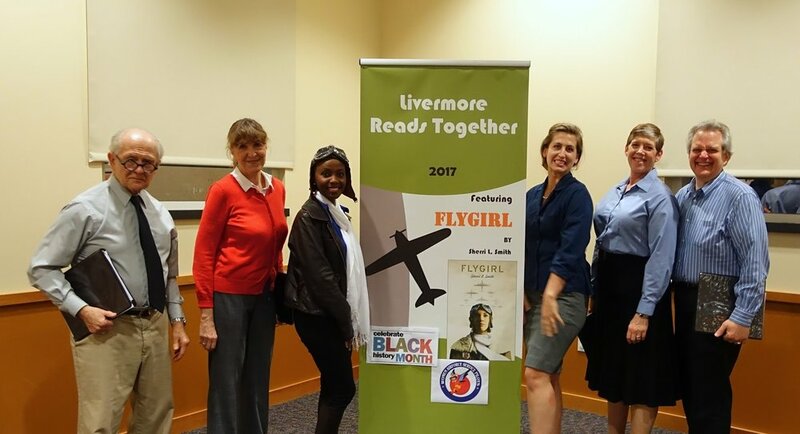 Thanks to Paul Sevilla, Jennifer Mosel, the Friends of Livermore Library, Nate, and everyone else who helped make Livermore Reads Flygirl Together a smashing success.